customers with debt relief and bankruptcy avoidance. The Client is among the country’s many credit repair and debt relief companies offering Part IX Debt administration, which are services that help customers handle debt and avoid personal bankruptcy. The Client is looking to expand its share of this growing sector with its unique value proposition centered around having “the fairest fee structure in the market” as well as its reputation as an established industry player. While there are ample opportunities to increase its customer base for debt agreement solutions, the Client also faces a number of hurdles when it comes to marketing and promoting these services. Regulations related to the aggressive marketing of debt agreements and cases of misrepresentation by other debt relief providers have made finding potential customers even more challenging. Accordingly, the Client decided to focus its debt agreement marketing initiatives only on individuals who have already expressed some level of interest in its other loan services and have communicated with the Client in the recent past. This ensured that the target prospects are not entirely cold while, at the same time, providing the Client with the needed information to refine the outreach effort. Based on these initial requirements, the Client was able to come up with a list of potential customers to target with its debt agreement offer. The plan called for the Client’s in-house consultants to contact qualified prospects and find out how its solutions fit with their current financial situation. To maximize their consultants’ productivity, the Client opted to hire the services of a third-party provider for carrying out the initial touch points and qualifying activities. The Client chose Callbox because of the latter’s experience in planning and executing Australia-wide lead generation campaigns as well as its roster of clients in the heavily-regulated financial services sector. The Callbox team put together a phone-based lead generation program designed for a B2C campaign. Due to the nature of the project (i.e., aimed at consumers), it was determined that the best approach would be to engage prospects solely through live conversations without integrating other channels into the mix. 1. The client provided the Callbox team with records tobe contacted. The list only included individuals who have interacted with the Client in the past such as through a loan application. As is standard practice in Callbox campaigns, the list was thoroughly profiled and validated before being used. 2. Campaign materials and collaterals, including call scripts, were produced in close consultation with the Client to ensure compliance. 3. Agents qualified every prospect with probing questions that identified their suitability and willingness to further engage with the Client’s debt counselors. 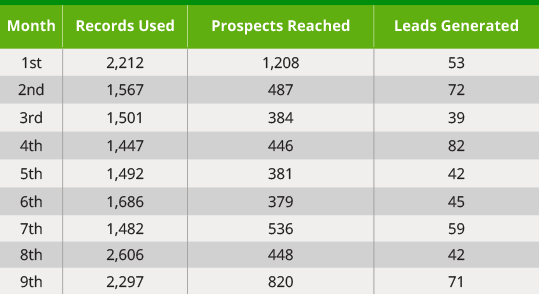 Prospects having personal debt, net assets, and disposable income within a given range were tagged as qualified leads. • Reach rates of up to 55% with an average of 31%. By comparison, a reach rate of 15% is considered acceptable while 30% is quite good. 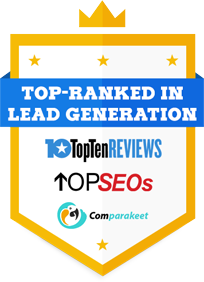 • Response rates of over 18% with an average of 11%, which is in line with phone prospecting benchmarks of 9% to 10% for this type of list. All in all, the nine-month campaign produced a total of 505 qualified leads handed over for further engagement with the Client’s in-house consultants. By the Client’s own estimates, between 70% to 80% of the leads are expected to become customers within six months after the campaign. As such, the Client is looking to potentially generate around 354 to 404 new customers for its Part IX Debt Agreement dministration services.